We find that getting one of our veg boxes, for most new customers, is a really an eye-opener according to feedback we get. Most, I think, are getting a box because they want to eat better, with a wider range of veg, and are fed up of poor quality veg from the supermarkets. 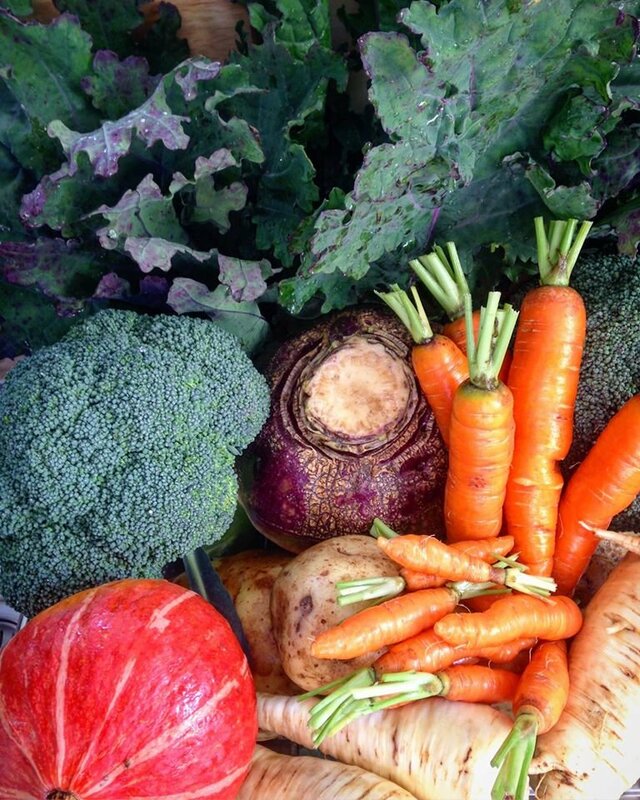 As you know, our veg comes direct from Kent farms and is picked fresh for your order. We rarely need to go outside the county; sometimes winter defeats us…; but we never go overseas. You won’t find Kenyan Green Beans in our boxes. So what do you think? Probably the first thing to note will be the colour and smell of the veg. As it is fresh it is so much more vibrant. Smell is a good indicator of aging so have a sniff. The other thing to note is how hard the veg is. Fresh veg, particularly roots and brassicas, are very firm when fresh. As they age they get looser and floppy.……I know…..
Also some of it is dirty. Sorry about that, but it is pulled straight from the field to your box and whilst we do try and get the majority of the mud off, blasting with warm water (like the supermarkets do) does nothing to improve the veg, if anything it harms it. You’ll also notice that some of the veg is misshapen, marked or even got the odd nibble. Our farmers use the tasty varieties, not the one that grow the same. They do not use any chemicals really, just the odd occasion if the bugs really take hold. So you might find a traveller! Finally that last thing you’ll notice, later on, is how well the veg lasts. As it is dug fresh for you most will last 2 weeks easily in the fridge. So don’t feel you have to eat it all in one go! Probably the biggest thing you’ll realise is that some of the veg, or the amount of it, are big. Really big. This is where using our boxes does differ from the supermarket.Nobody likes waste – so when you get a cabbage the size your head then please do not put it to the back of the fridge and forget about it. Think – I have enough here for several meals over the next couple of weeks, let’s get busy. We have plenty of ideas etc on how to use the veg, and our PINTEREST BOARDS have tonnes of ideas, with one of the boards for the current week’s box. There’s also a board with ideas on how to use veg in different ways so that you don’t waste it – cabbage cake anyone? Make sure our email address is added to your address book to so we don’t get spammed out. Please look at our website at the FAQ & WHY US sections for info about how the scheme works etc. We will be in touch shortly after your first box to see how you want to carry on with your boxes – we are sure you will! Previous Post Why Eat Fruit & Veg? Next Post Kentish Salami? Oh yes….